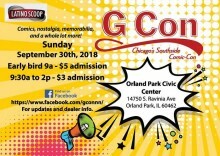 On September 30th, GCon will be on! Come to a family-friendly show where you can get sketches done of your favorite character, buy a comic book of your choice, and participate in hourly raffles! Come down, take a look around, and spend your day at GCon. Hope to see you there!